Hot peppers are native to the New World but were spread rapidly around the world after Columbus’s voyage. They became incorporated into the cuisines of people living in hot, tropical climates in part due to their ability to kill worms and open the sweat pores. Hot peppers contain abundant amounts of a volatile oil called capsaicin as well as minerals and starches. Hot peppers are highly stimulating and heating which moves the blood to the surface, increases circulation and clears the capillaries of stagnation. Capsaicin has anti-inflammatory and pain-relieving properties and also helps open up sinuses when suffering from a cold. Jalapenos are best used in cooking. Add whenever you want a little (or a lot of) spicy in your dish. 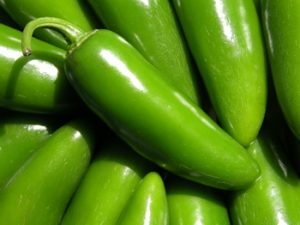 Keep in mind each jalapenos varies in spicy level; a little too much could make your meal an overly firey experience. Jalapenos pair well with Mexican, Central and South American food as well as Asian dishes. We suggest using gloves while making this hot sauce as the cut jalapenos can really burn. Pull off the stems from your jalapenos. In a food processor, blend the peppers and some garlic into a pulpy mesh. Pour the mixture into a clean glass jar. Note the volume of the mash and add approximately enough salt so that there is a 30:1 pepper to salt ratio. The salt helps to pull water from the peppers, deepen the flavor and act as a preservative. Mix the salt into the pepper mash. There should be enough liquid in the jar to cover the pepper mash. The brine acts as the protective buffer to keep the sauce from spoiling. Loosely screw a lid onto the jar, place it on a plate (to catch overflow) and allow the sauce to ferment for 1 month in a cool, dark place. After a month, your hot sauce is ready and should be kept in the refrigerator. If you want to have your sauce taste more like Tabasco, you can stir in a little bit of vinegar. The finished sauce should keep for at least several months in the refrigerator if not longer. Cautions/Contraindications: Jalapenos may be overheating for some and therefore irritating.